The Crusades history. Teutonic Order of Knighthood. Home » The Crusades history. Teutonic Order of Knighthood. Order of Brothers of the German House of Saint Mary in Jerusalem. History of German Crusaders, 12th Century. “War, of all bad things Worst, and man’s crowning crime; save when for faith Or freedom waged.” Bailey. It is not possible to find the exact date of the foundation of the Teutonic Order, but it was probably about A.D. 1190 that it received its full organization as one of the recognized Religious Military Orders. There are also a variety of information. Its actual commencement, like that of the other Orders, was obscure and humble. The origins of the Order are in a field hospital north German merchants during the III. Crusade in the Holy Land in 1190 at the siege of Acre. The other founding history dates back to the years 1128 or 1129, a wealthy German, who had taken part in the siege and capture of Jerusalem, settled there with his wife, intending to spend the remainder of his life in the practice of religion and in visiting the holy places. His attention and interest were soon excited by the misfortunes of his poorer countrymen, who came in great numbers as pilgrims to Jerusalem. Many fell sick, and endured great miseries and hardships. Moved with compassion, he received some of the more distressing cases into his own house. But he soon found that the work grew beyond this, and he built a hospital, with a chapel dedicated to the Blessed Virgin. In this institution he passed the whole of his time, nursing the sick pilgrims; and to their maintenance he devoted the whole of his means. But still the work enlarged, and his own fortune was insufficient for the increasing expenditure. He therefore commenced soliciting alms for the continuance and enlargement of his charity, and his wife devoted herself to a similar care of the female pilgrims who were too poor to pay for medical attendance and nursing during sickness. Many of his wealthier countrymen not only gave him money, but associated themselves with him in actual work. Men of noble family and gentle blood, who had quitted their own homes and country to fight in defense of the Holy Land, banded themselves together, after the pattern of the Order of St. John of Jerusalem, and united the care of the sick and poor with the profession of arms in their defence, under the title of Hospitallers of the Blessed Virgin. This little band put themselves under the direction of the Grand Prior of the Hospitallers of St. John of Jerusalem, although they did not actually join this Order, whose operations they so closely imitated. 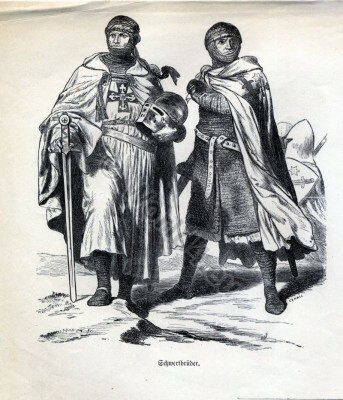 The Teutonic Knights Hospitallers continued their work, both in the hospital and in the fiehl, till Jerusalem was besieged and taken by Saladin. This event caused a serious cheek to the development of the Order. Saladin, struck with the devotion of these men to the suffering and poor, permitted some of their number to remain in Jerusalem and continue their humane ministrations. It was, however, during the siege of Acre that the Teutonic Order received its final and complete organization as one of the great Military Religious Orders of Europe. The German knights suffered great miseries from sickness and from their wounds, and as their language was not understood by the French and other European contingents of the crusading army, they were left untended and friendless. To meet they want, some citizens of Bremen and Lubeck provided a sort of field hospital, and devoted themselves to the care of their wounded and sick countrymen. These were soon joined by others, and by the brethren of the Hospital of the Blessed Virgin at Jerusalem, whom Saladin had banished from the city, and the little body came to be known by the designation of the Teutonic Knights of the Hospital of the Blessed Virgin at Jerusalem. It is said that the Order owed its constitution to Frederick, Duke of Swabia; but there is much obscurity, and little authentic record to determine this or to furnish particulars of the transaction. Poorer countrymen, who came in great numbers as pilgrims to Jerusalem. Many fell sick, and endured great miseries and hardships. Moved with compassion, he received some of the more distressing cases into his own house. But he soon found that the work grew beyond this, and he built a hospital, with a chapel dedicated to the Blessed Virgin. In this institution he passed the whole of his time, nursing the sick pilgrims; and to their maintenance he devoted the whole of his means. But still the work enlarged, and his own fortune was insufficient for the increasing expenditure. He therefore commenced soliciting alms for the continuance and enlargement of his charity, and his wife devoted herself to a similar care of the female pilgrims who were too poor to pay for medical attendance and nursing during sickness. Many of his wealthier countrymen not only gave him money, but associated themselves with him in actual work. Men of noble family and gentle blood, who had quitted their own homes and country to fight in defense of the Holy Land, banded themselves together, after the pattern of the Order of St. John of Jerusalem, and united the care of the sick and poor with the profession of arms in their defense, under the title of Hospitallers of the Blessed Virgin. This little band put themselves under the direction of the Grand Prior of the Hospitallers of St. John of Jerusalem, although they did not actually join this Order, whose operations they so closely imitated. The Teutonic Hospitallers continued their work, both in the hospital and in the field, till Jerusalem was besieged and taken by Saladin. This event caused a serious cheek to the development of the Order. Saladin, struck with the devotion of these men to the suffering and poor, permitted some of their number to remain in Jerusalem and continue their humane ministrations. It was, however, during the siege of Acre that the Teutonic Order received its final and complete organization as one of the great Military Religious Orders of Europe. The Order seems, however, to have been confirmed by Pope Celestine III., the constitution and rules of the Templars and Hospitallers being; taken as the model for the new Order, Henry de Walpot being the first Master. This appears to have happened about a.d. 1190, though some authorities maintain that it was not till 1191, or even later. While, therefore, the three great Orders had much in common, there was this difference in their original foundation. The Hospitallers were at first a nursing Order, and gradually became military; the Templars were always purely and solely military; while the Teutonic Knights were from the first both military and nursing. Contemporary chroniclers compare the Teutonic Knights with the mystic living creature seen by Ezekiel, having the faces of a man and of a lion, the former indicating the charity with which they tended the sick ; the latter, the courage and daring with which they met and fought the enemies of Christ. The Teutonic Knights continued their care of the sick soldiers till Acre was taken in July, 1191, by the united forces of Philip Augustus, King of France, and Richard, Coeur de Lion, King of England. After the capture of Acre by the Christian army, Henry de Walpot purchased a site within the city, and built a church and hospital for his Order, the first that it possessed. To these buildings were gradually added lodgings for the members of the Order, for pilgrims, and for the soldiers which were enlisted to assist the knights in the field. All this cost a large sum of money; but, as many wealthy Germans had enrolled themselves as knights, means were not wanting as the occasion for them occurred and the requirements of the Order developed. Among the greatest of the earlier benefactors was Frederick, Duke of Suabia, who contributed money and aided the progress of the Order by his influence, and, when he died at Acre, was interred in the church of the knights. Contemporary writers speak in the highest terms of his virtues, saying that he lived a hero and died a saint. At this period and for the rest of its history, the constitution of the Teutonic Order embraced two classes of members: 1. The knights; 2. The clergy; both being exclusively of German birth. The knights were required to be of noble family, and, besides the ordinary threefold monastic vows, took a fourth vow, that they would devote themselves to the care of the sick and to fight the enemies of the faith. Their dress was black, over which a white cloak with a black cross upon the left shoulder was worn. The clergy were not necessarily of noble birth, their duties being to minister to the Order in their churches, to the sick in the hospitals and on the field of battle. To these two classes, who constituted the Order, were added serving brethren, called Heimlike and Soldner, and in Latin, Familiares. Many of these gave their services gratuitously from religious motives; others received payment and were really servants. The knights selected their esquires from among the serving brothers. All these wore a dress of the same color as the knights, that they might be known at once to belong to the Order. The original rules of the Order were very severe. All the members lived in common; they slept in dormitories on small and hard beds; they took their meals together in the refectory, and their fare was meagre and of the plainest quality. They were required to attend the daily services in the church, and to recite certain prayers and offices privately. They were not permitted to leave their convent, nor to write or receive letters, without permission of their superior. Their clothes, armour, and the harness of their horses were all of the plainest description; all gold, jewels, and other costly ornaments being strictly forbidden. Arms of the best temper and horses of good breed were provided. When they marched to battle, each knight had three or four horses, and an esquire carried his shield and lance. The Grand Master was elected from the class of the knights only. Next in rank to him was the Preceptor, or Grand Commander, who had the general supervision of the clergy and serving brethren, and who presided in chapter in the absence of the Grand Master. Next to the Preceptor came the Marshal, who acted as Lieutenant-General in the field of battle under the Grand Master. The third dignitary was the Grand Hospitaller, who had the superintendence of the hospitals and of all that related to their management. The fourth officer was the Trappier, who supplied the knights with their clothing and accoutrements. And, lastly, there was the Treasurer, who received and paid all the money that passed through the hands of the Order. All these officers were removable, and were commonly changed every year. As the Order extended, new functionaries were required, and were appointed; viz., provincial masters of the several countries where the Order obtained possessions, who took rank next after the Grand Master; and there were also many local officers as particular circumstances required. The Grand Master was not absolute, but was obliged to seek the advice of the chapter before taking any important step, and if he were necessarily absent, he appointed a lieutenant to act for him, who also governed the Order after the death of the Grand Master till his successor was elected. 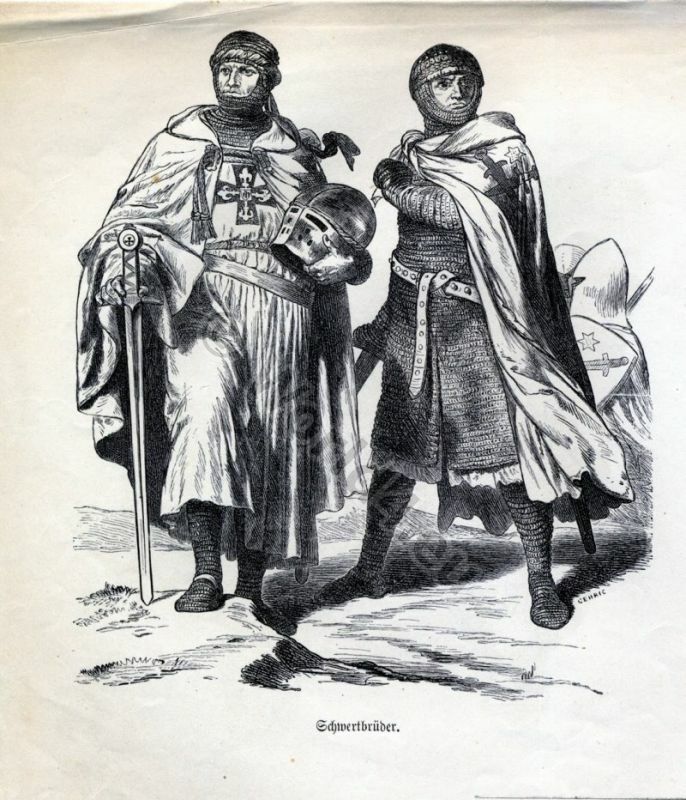 After the death of Saladin, disputes arose among his sons, and the opportunity was seized of commencing a new crusade, the history of which is well known, and in which the Teutonic Knights took an active part. At this time, A.D. 1197, Henry VI., Emperor of Germany, gave the knights the monastery of the Cistercians, at Palermo, in Sicily, and several privileges and exemptions — a transaction that caused considerable disagreement between the Pope and the Emperor. The knights were, however, finally confirmed in possession of the monastery, and it became the Preceptory or chief house of the Order in Sicily, where other property was gradually bestowed upon the knights. Henry de Walpot, the first Grand Master, died at Acre, in A.D. 1200, and was succeeded by Otho de Kerpen, who was an octogenarian at the time of his election, but full of vigour and energy, which he displayed by devoted attention to the duties of his office, and personal attendance upon the sick in the hospitals. During the mastership of Otho de Kerpen, an Order of knighthood arose in the north of Europe, which was afterwards incorporated with the Teutonic Order. Livonia, a country situated on the borders of the Baltic, was at this time still pagan. The merchants of Bremen and Lubeck, who had trading relations with the inhabitants, desired to impart to them the truths and blessings of Christianity, and took a monk of the name of Menard to teach them the elements of the faith. The work succeeded, and Menard was consecrated bishop, and fixed his see at Uxhul, which was afterwards transferred to Riga. The mission, however, as it advanced, aroused the jealousy and suspicion of the pagan nobles, and they attacked and destroyed the new town, with its cathedral and other buildings. The bishop appealed to his countrymen for help. Many responded to his call, and as there was at that time no crusade in progress in Palestine, the Pope (A.D. 1199) was persuaded to accord to those who took up arms for the defense of the Christians in Livonia the same privileges as were given to those who actually went to the Holy Land. In consequence of these events, a military religious Order was founded, to assist in this war, called the Order of Christ, which was confirmed by Pope Innocent III., in A.D. 1205. The knights wore a white robe, upon which a red sword and a star were emblazoned. They maintained a vigorous and successful conflict with the heathen, till circumstances rendered it desirable that they should be incorporated with the Teutonic Knights. In the mean time, the Latins had seized Constantinople, and set up Baldwin, Count of Flanders, as Emperor, and divided the Eastern empire among themselves. The Teutonic Knights received considerable possessions, and a Preceptory was founded in Achaia. Some time afterwards, another was established in Armenia, where also the Order had obtained property and territory in return for service rendered in the field. The Order also received the distinction of adding to their bearings the Cross of Jerusalem. The valor of the knights, however, and the active part which they took in all the religious wars of the day, cost them dear, and from time to time their numbers were greatly reduced; so much so that when Herman de Salza was elected Grand Master, A.D. 1210, he found the Order so weak that he declared he would gladly sacrifice one of his eyes if he could thereby be assured that he should always have ten knights to follow him to battle with the infidels. The vigour of his administration brought new life to the Order, and he was able to carry on its mission with such success, that at his death there were no less than two thousand German nobles who had assumed the badge of the Order and fought under its banner. Large accessions of property also came at this time to the knights in Hungary, Prussia, Livonia, and elsewhere. In A.D. 1214, the Emperor Frederick I. decreed that the Grand Master should always be considered a member of the Imperial Court, that whenever he visited it he should be lodged at the Emperor’s expense, and that two knights should always have quarters assigned them in the Imperial household. In A.D. 1221, the Emperor Frederick II., by an Imperial act, took the Teutonic Order under his special protection, including all its property and servants; exempted them from all taxes and dues; and gave its members free use of all pastures, rivers, and forests in his dominions. And in A.D. 1227 Henry commanded that all proceedings in his courts should be conducted without cost to the Order. The King of Hungary also, seeing the valor of the knights, endeavored to secure his own possessions by giving them charge of several of his frontier towns. Source: On the history of costumes. From Ancient to the 19th century. This entry was posted in 12th Century, Ecclesiastical, Fashion History, Germany, Middle Ages, Military and tagged Crusaders, Gothic costumes, Knighthood on 5/14/13 by world4.